For the last week I've had to force myself to no longer knit for fear of doing what could be permanent damage to my wrists. Because I currently have a cut tie to the Viking sewing machine I was sew diligently using last year this leaves me with a need for another gratifying craft that will fill the knitting void as well as still provide me with items for the store. I have been hard at work for the last two days and have turned out a ton of new items. What they are I'm not ready to tell you yet but I feel you will most likely be pleased. When will they be out? I'm working on building a decent sized stock for you to peruse so they could be released anywhere within the next month to the next three months depending on the ultimate size of my stock and when my wrists heal enough for me to begin knitting again. *Important note: The item shown will not be for sale. It's the item that lead to my wrist pain. This item is mean to be MINE ALL MINE!!! You know that saying, "You can't live with them, you can't live without them"? 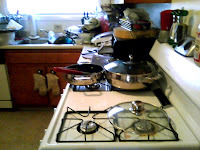 As much as I love the boy, during the years we were dating and did not cohabitate, my apartments were much neater than my house tends to be these days. I do what I can to keep the place respectable but DH is a whirlwind of mess. I swear his clothes seem to fly off of his body in every direction while spewing crumbs so that he may find his way back to them without tripping over whatever else is in the floor. Husbands, in general are just a messy breed and little to nothing can be done about it. 2004, South Philadelphia. It's winter, I'm new here, and I could really use something comforting to make me feel at home, even if it's just for an hour or two. 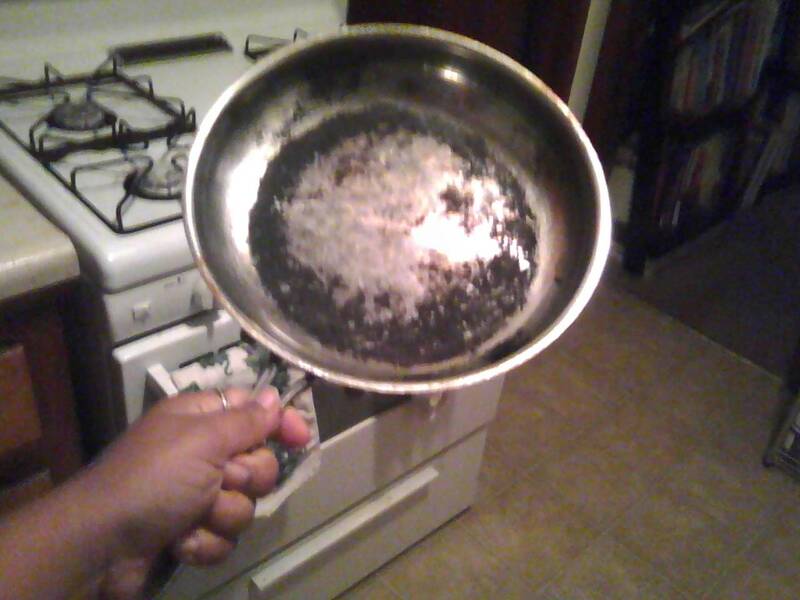 The house I'm currently living in seems to be devoid of frying pans. 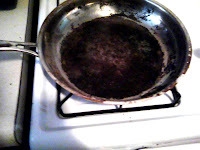 The purchase of an "emergency pan" was necessary. Any excuse to visit Fante's on 9th street in the heart of the Italian market is a good one. 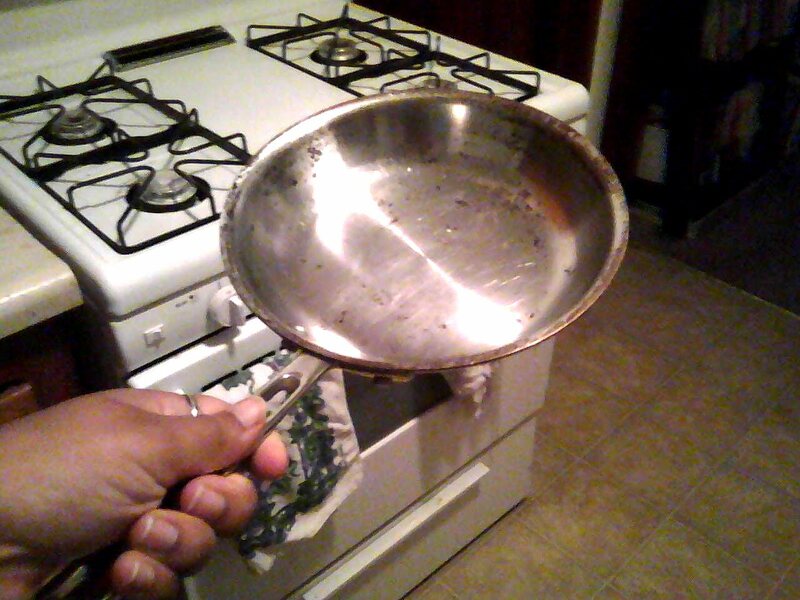 It was there that I purchased the 10" frying pan that somewhere along the last six years has become "the boys pan." Tired of his aggressive use of metal implements in my non-stick Tupperware pans (Yes, Tupperware makes pans. 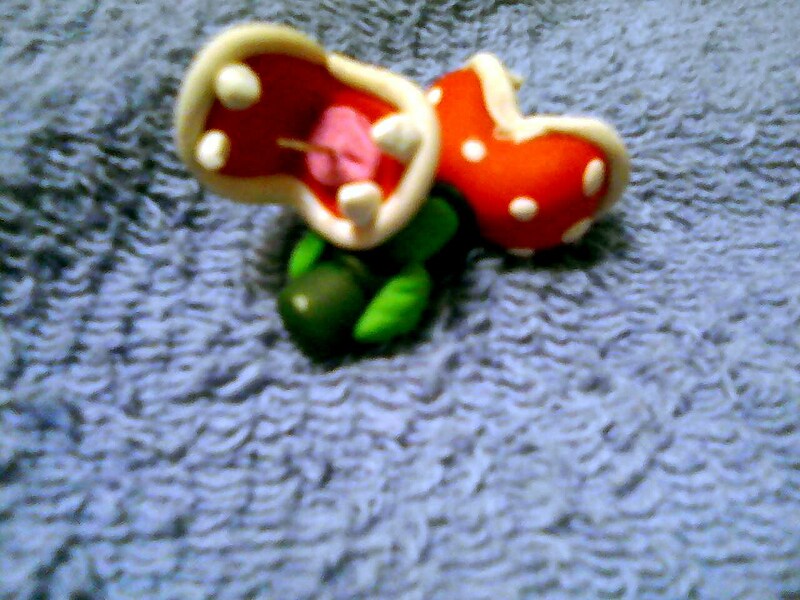 And they're awesome.) I informed him that this was now "his" pan and he was in charge of it's care. 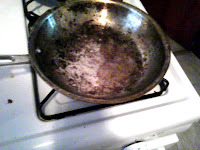 This is what the pan looks like now (after vigorous scrubbing). The problem is, he's been occasionally using some of my other pans. For example my copper core fry pan from Williams-Sonoma. Today during a Felix Unger meets Shirley Feeney style fit of cleaning I broke out the pans and attacked them with baking soda and elbow grease. The results were minuscule. 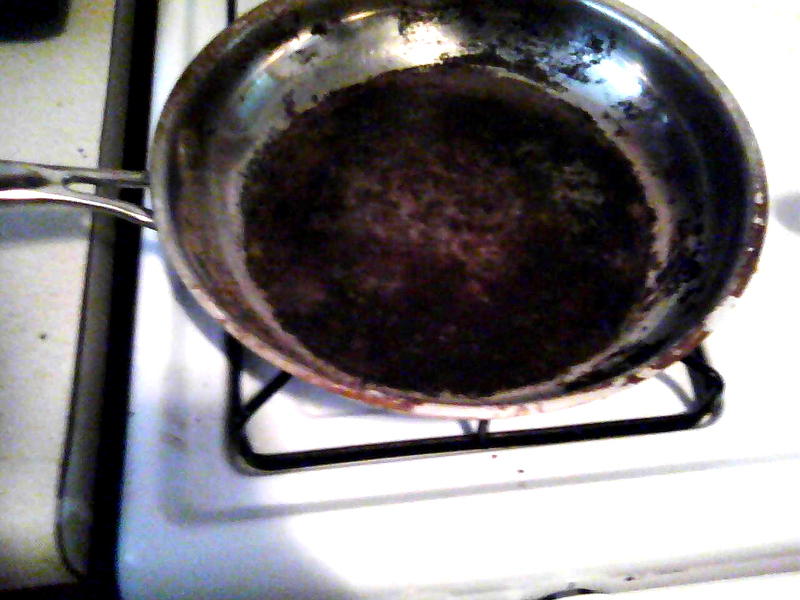 and the results on "the boys pan" were a small dent. The pan (in my opinion) is still in need of divine intervention. I'm gonna need more elbow grease. It's a good thing I have an economy sized bag of baking soda . . .
As I briefly mentioned on the Pro-Portional Designs Facebook fan page, I've begun a new sister site called Small Fries. If you follow the hypertext link you can read the first post and see what it's all about. I am also in the process of setting up the coordinating Facebook fan page. Because Small Fries is still an Om Nom Nom Studios project it's Facebook will be linked to the Om Nom Nom Studios Twitter feed. Last night for dinner I (yet again) made a roasted red pepper & red cabbage salad. 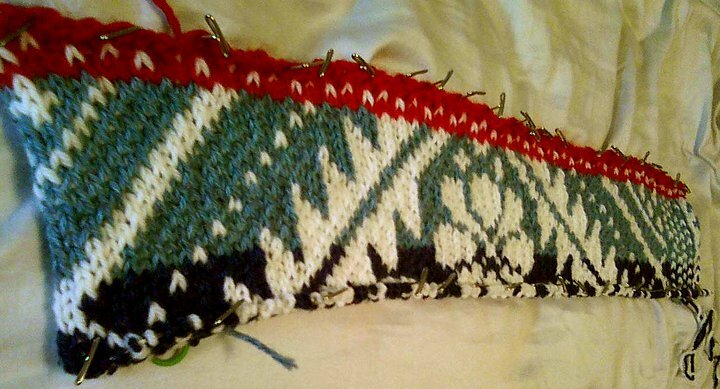 It's fairly quick and easy and brings back some fond memories of a friend I had years ago who first made it for me. When I sent a picture of the salad to a family member last night she told me she thought that would go over well in her household and asked me how to make it. This morning when posting a great friend of mine from high school seemed to feel the same way. I began to post the recipe on Facebook and then realized it was long enough that I may as well blog it. It's up to you if you choose to prep your cabbage first, last, or while you work on the red peppers. Pull off the outer leaves that look yucky from the store. Take your chefs knife and begin slicing it however thin or thick you like. Once you have as much as you want. Cut the sliced pieces the other direction as well so the slices are more manageable for you to eat. I probably do that around 4 or 5 times depending on the original size of the cabbage. Rinse the cabbage in the sink. If using only one red pepper like I did last night, I just rub it down with some olive oil, when using multiples I drizzle the olive oil over all of them insuring that enough of the skins are coated with oil. Once you've coated your red pepper(s) place it/them on a cookie sheet (last night I used a small bread pan and all was still just fine) in the oven at 350 and wait for the skin to pucker. Remove the pepper from the oven. Turn off the oven (bc I forgot to last night) and let the pepper cool a little bit. It doesn't need to get cold just manageable enough for you to hold in your hand. Take your pepper over to the sink and the first thing I do is pull out the stem. WATCH OUT FOR HOT OIL!!!! It tends to pour right out at this point and I've gotten a hand of hot oil a couple of times. Gently peel away the skin of the pepper. If you're too rough you can take chunks of pepper with it. This can also happen if the skin is not puckered enough all over the body of the pepper. Once you've skinned the pepper. Lay it out on a cutting board and slice as thin or thick as you like lengthwise. Place your red cabbage in a bowl or on a plate. Arrange your red pepper on top (peppers can be hot or cold - that's your call). Drizzle with however much red wine vinegar you like. I mentioned the other day there's been a change in schedule around my house that I am now adjusting to. Which really, is almost cruel, because in another two months, this new schedule (I'm sure) will be shot into the stars while I adjust to baby nom. My weekends are now no longer on the actual weekend. They are Monday evening to Thursday evening. I plan to do my best to adjust and keep bringing you foods news, pics, and nonsense at as regular an interval as possible (the bulk of which is most easily viewed on the Facebook fan page) and not totally forsake you during "the weekend." We're having a sick day here at Chez Nom. Some of you may have read that last night the boy came home looking and feeling a lot like death. 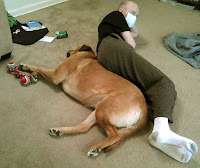 Today he is feeling very slightly better but is definitely still not up to his regularly scheduled state of function. 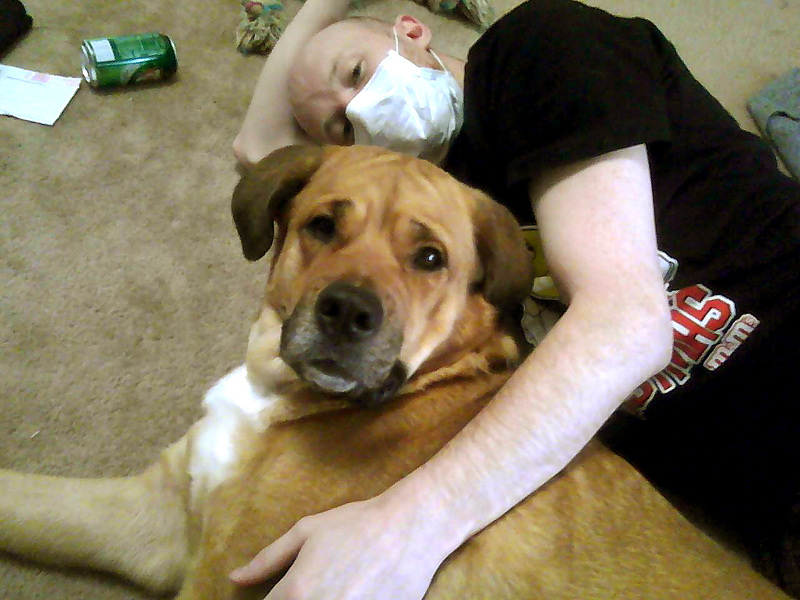 He's taken great care in making sure not to possibly get me sick just in case whatever he has in contagious. 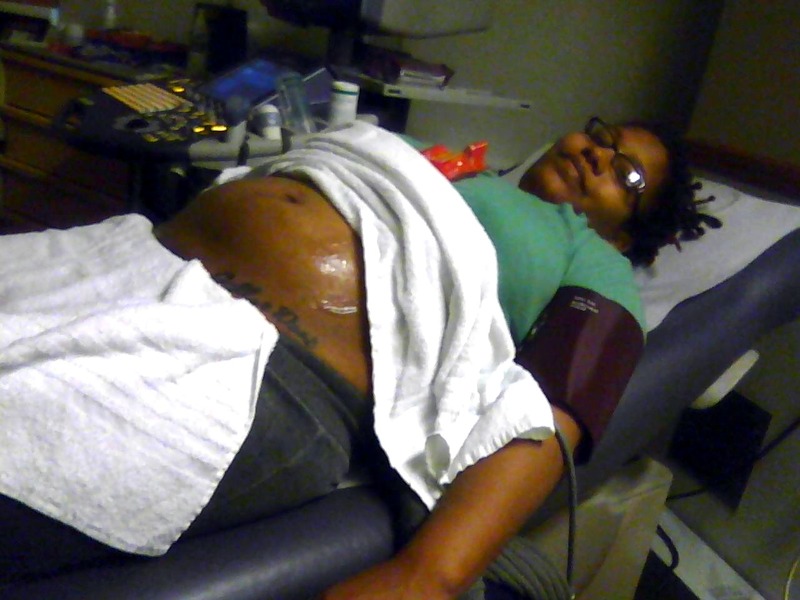 Perfect has been a bit sick as well as of late, something seems to have given her a bit of tummy trouble. As for myself, last night I took on a little more I could handle with the cold walk back to my car that was nowhere near last nights basketball game at the Schottenstein Center. My night was spent unable to roll over and a couple of charlie horses that lead to me screaming for a few minutes. So my messy kitchen is just going to have to wait. 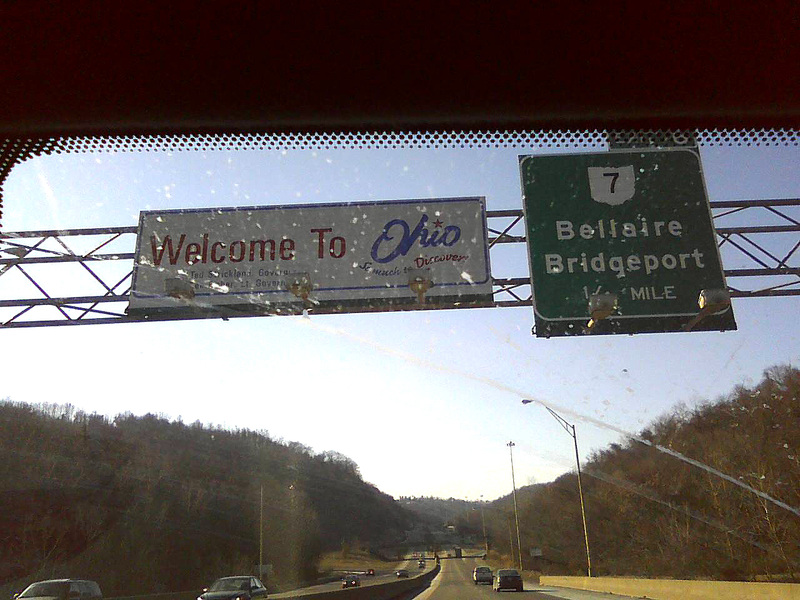 Obviously with my recent trip home* I did not spend the Christmas holiday with my family here in Ohio. Upon our arrival back into the state there was a bit of Christmas waiting here for us (as well as our dog who was more than thrilled we were finally back). A few years ago the boys grandma offered to make me a quilt and in making it wanted to know what sort of things I liked so that she could try to incorporate them into it. I believe my response was "food, books, and wine." After a lot of effort finding the appropriate scraps of material to make this quilt a reality I finally have it and it was of course worth the wait. 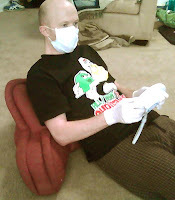 Recently I made a brief post via the Facebook fan page with the promise of more/better photos. Not to worry everyone. Grandma got Perfect a Christmas present too. And she LOVES it. *In the hyperlink video I am seen wearing the shawl I gave to my mother as a Christmas gift. 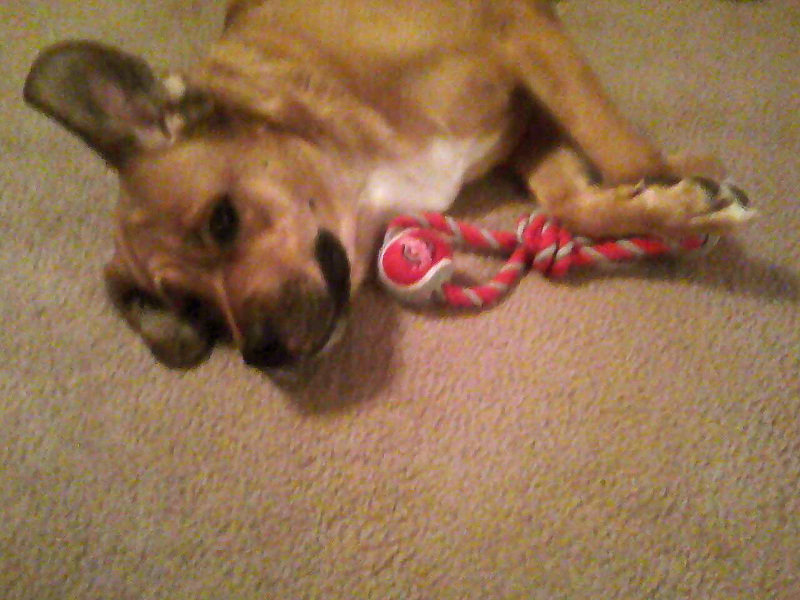 This is her in her gift. 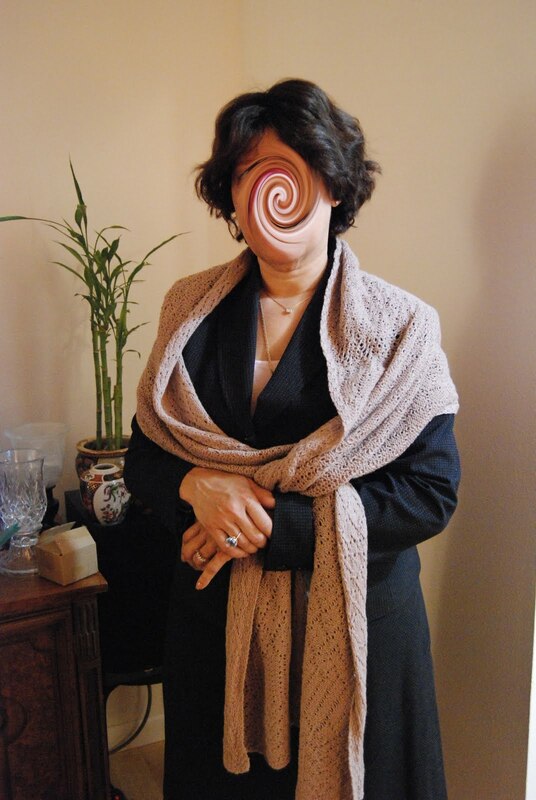 To let her keep a modicum of privacy I've blurred her face, don't worry, my mother's face doesn't look like that in person. It's a perfectly lovely face, no blurs about it.